Overwhelm. It’s something that most of us are all too familiar with. It’s that gut-wrenching feeling we get when we’re struggling to balance or prioritize (too) many tasks, or when too much is going on and we might feel out of control. Ironically, as a small business owner who is “in control” or drives the work and direction, it’s still a familiar situation, and yet it feels so completely different at times. When you’re the one creating the work and doing the work…it’s all you. You’re telling yourself what to do. You’re overwhelming yourself. You’re not alone. I’m not alone in this. None of us are. 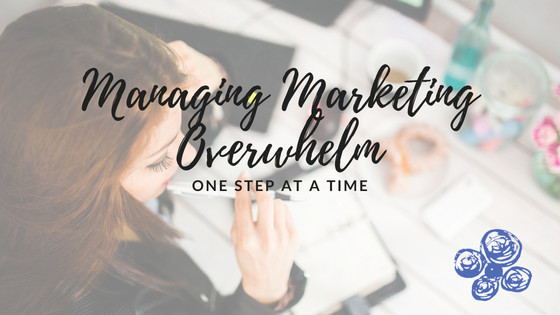 This morning was our Mondays are for Marketing event in Portsmouth, and one of the topics that came up was *shockingly* a form of overwhelm. It’s actually something that overwhelms me quite a bit, and I’m willing to go out on a limb and say it probably gets you, too. Especially if you’re a recovering control enthusiast like myself that also suffers from post-perfectionista syndrome! Doable and sometimes feels so out of reach. So how does one get this magical map so they can experience the zen after overwhelm? Wait – does that even exist??? Strategy is super important. You need to look at the big picture and not forget how beautiful it is. You have dreams. And from those dreams you set your goals. then, you take those goals and put the steps in place to get them. But that really oversimplifies it, doesn’t it? While it’s not that easy…it’s not that hard, either. It just takes some time, focus, outside brainwaves (aka support), and lots of questions to get there. That peaceful zen-like feeling is out there. And having that full-blown strategy is part of the solution. So where can you start? The you that is sitting at your laptop, hesitating to work with someone on figuring out your strategy because you’re scared that it’s just more work and wheel spinning. The you that is dreading trying one more thing only to have it feel like it’s falling into some abyss where nobody sees or hears it… Yeah, you. Let’s take it one step at a time. This morning, we started by figuring out your ideal client. You know, the one that you jump out of bed in the morning ridiculously excited to work with – every single day. It may feel counterintuitive at first, narrowing down your audience when you want to GROW your audience… but think about it. When it’s all said and done, you want the right people – more of these get-you-out-of-bed kinds of clients – knocking down your door (or your website) because they know what they need and that it’s you. And you know you can help them with their need better than anyone else…because you’ve done your homework. You’ve thought it through over and over…you’ve asked them and you’ve put yourself in their shoes. You’re talking to THEM about THEM, not about you. Your work is no longer lost in the abyss. Now, this isn’t always the first step, but it’s ONE of the first every time. The focus you put into identifying your ideal client will help drive everything else, from messaging to content to packaging and pricing and beyond. And that feeling of relief once you have clarity around your ideal client? Well, that’s the complete opposite of overwhelm.